﻿﻿﻿﻿ No Bacon!?!? That was the first exclamation most BurgerClubbers made. V.J.’s does not put bacon on their burgers. Their advice was, if you really want bacon, go next door to Johnny G’s. One diner stated “I didn't think it was possible to score lower on the bacon scale than Johnny G's 1/2 slice” I’ve always thought V.J.’s made a fabulous burger but I guess I’ve gone with rose coloured glasses - all caught up with the charm of eating at V.J.’s and not really paying attention to the burger. Analytical eating has removed the flavour from V.J.’s for me. It’s a decent burger, but disappointing after some of the others we’ve tried. Zax still comes up every week for how good it was. 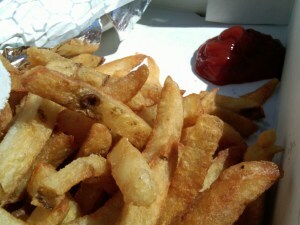 Somewhere along the way most burger clubbers stopped ordering fries, and the V.J.’s order-taker was a little surprised that only a couple did. That’s because their fries are awesome - one diner said “The fries are their own food group” - but the burgers, not so much. One of the things that makes V.J.’s special is their chili sauce - and they put on lots of it. Its messy eating so don’t wear a white shirt. It was hot and brilliantly sunny - perfect weather. We’ve been waiting for this day to come so we could dine outdoors. The only tricky part was the wind so you had to guard your serviette/burger wrapper/skirt (as appropriate). 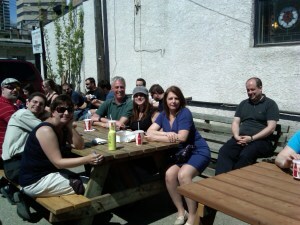 Some of the folks who got there early grabbed two of the picnic tables so all twelve of us could sit together - well except Dani who wisely chose to sit in the shade up against the burger shack. If you’ve never been to V.J.’s they have a system. There is a covered walkway across the front. When you come in there’s an order-taker (with impeccable memory) standing in the doorway to the kitchen. She finds out what you want while you’re standing in line. You have to be ready for this because you probably can’t see the menu in the kitchen and the menu over the pickup window doesn’t have any prices on it. She relays the info to the burger flipper and assemblers, and you shuffle up to the window to pay the money person, take your food and exit out the other end of the corridor. It’s very efficient. The burger patties were thinish, hand formed and kind’ve soft and squishy. They didn’t have any particular flavour. I’m glad I ordered a double because a single wouldn’t have cut it. 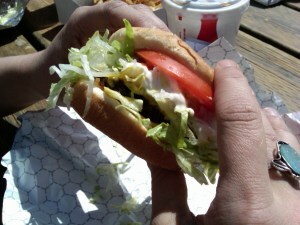 People that had the V.J.s special with lettuce and tomato observed that the patty got lost on the burger. This may not be such a slight to the burger as testament to the piles of shredded lettuce and layers of ripe tomato on V.J.’s version of the Fatboy. The bun was nothing special - it was squishy and small, but it did do the job and held together despite all the chili sauce. One diner said the bun sucked, but I think she must be very particular about her buns. There was a hand printed sign for Lime Milkshakes in the window and one diner tried it. He said it was “drinkable”. Another diner had the strawberry-banana shake and said it was awesome and took her back to high school. She must’ve liked high school. 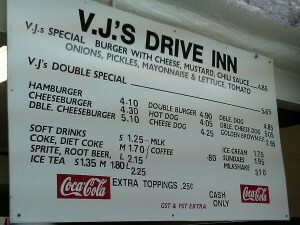 I’ve really enjoyed chili dogs at V.J.’s in the past and I’ll likely pick a dog over a burger when I go back. Arghhhhhhhhh. Well written blog but this was not what I expected. Not what I expected I say!!! 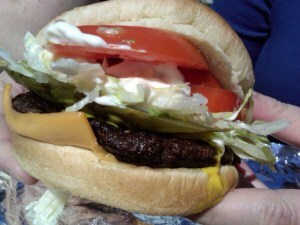 I can't believe that the double cheeseburger pictured above came from the same kitchen as the fatboy in the next photo. That cheeseburger is the Mickey Rourke of hamburgers. It looks like syphillis. I hope you live. Totally agree with you on this. 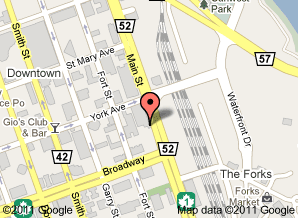 VJ's is one of the worse places in the city for a fatboy IMO. Their patties are tasteless. 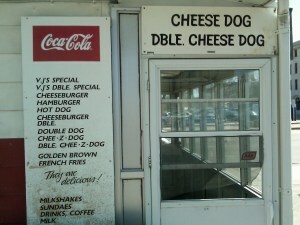 If I want a good burger I go to Dairy Delight. Never disappointed. I disagree with the burger assessment above. 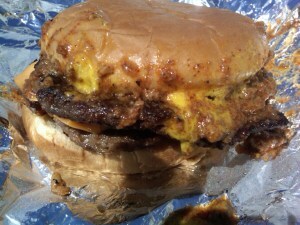 I've been going for Fatboys at VJ's since the late 80's, and have never been disappointed. And nobody in this article mentioned the pickle on the burger, which in my opinion, helps to elevate this burger above most others. I think it boils down to individual taste and preferences. I've preferred this burger for years, and will continue to in the future. To each his own. I never thought much of VJs, last time I visited was in 2007 I ordered a cheese burger which was starting to taste alright but I then bit into a bunch of the cooks arm hair. I was disgusted and will never be back! Agree with Anonymous about the pickle. In my opinion, having a proper pickle is way more important than bacon.